All of our hunts can be done individually or by groups, with your friends or family, or even organize a team competition – just choose the right option as you buy your treasure hunt! The recommended size of a team is 6 people, and if you have a larger group consider playing our competition option! Remember, you don`t need to download anything – the treasure hunt is on an online platform – but you will need the internet connection all the time to get new questions and send your answers. You can start whenever you want during 6 months after you buy the experience. Once started, the code will be active during 10 days. Each route has the length of 3 – 5 km and is designed for 2 – 3 hours, although it all depends on you – whether you want to take it slow and visit the museums and cafes on your way or challenge yourself and finish it as fast as possible! You can play any time you want, but to enjoy the fullest the places on the route it is recommended to play between 10 – 19 – this way all the sights on the way will be open to visitors. Get to the starting point and introduce the code that you’ve got by email at our game platform. Read the questions and riddles carefully and look for the answers at the location. Enter the answers into the answer window or use our help button if you get lost. Right answer leads you to the next challenge. Besides, you will find a lot of useful insights and tips about Barcelona, places to visit or things to try, as well as funny and curious information about the sites around you. Uncover the mystery with us! 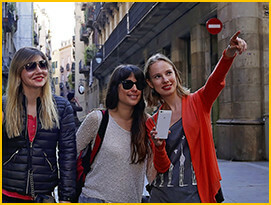 Play the city game, make cool photos on the way, learn interesting facts about Barcelona while completing the route! You can order a treasure hunt for a big group or for a special event - in this case we can arrange a real city competition! Our coordinator will meet you at the start, tell you the rules and give to the teams the hunt access codes and additional hunt materials - maps and paper hints and riddles. The participants will not only have to solve the riddles but to find the final point where they will meet the coordinator again - this time with prizes! The price for such event is different from a traditional hunt so write us all the details in advance - and we will give you the budget and prepare a great company team building event or bachelorette party for you! Make cool photos on the way, learn interesting facts about Barcelona, enjoy the sun and the city! Answer all the questions, complete the route and get a prize in the end! UnPuzzle Barcelona! Share your experience with us afterwards! 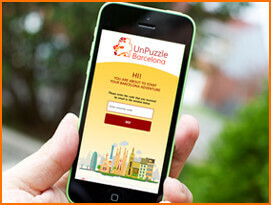 Tell it on the social media with a tag #unpuzzlebcn, send us the link and get a discount for the next hunt! 1. I`ve bought the hunt, what's next? You will get all the instructions and the activation code by email. Activate the game when you arrive to the starting point indicated in the e-mail. It is automatically generated and you will receive it a few minutes after the purchase. If you haven`t got the email, please write or call us before the game. 2. How much time do I need to complete the route? There are different ways of completing the game - you can go at your own pace, discovering the city without rush and making picture or lunch breaks. In this case it will take you longer than 2 hours. But the time is unlimited, so you can play as long as you want, and if you don't finish the quest, you can do it the next day. The code will be active for 6 months since the day of purchase and for 10 days since you start the quest. Another way is to buy the team competition option - in this case the faster you come to the finish - the better. 3. Do I need to download something? What kind of phone do I need? And if I run out of the battery? You don’t need to download anything; you will use a special online game platform. So the main thing you need is the internet connection and enough energy at your phone. If for some reason you need to enter the game from another device, just repeat the procedure - go to the game website and enter the code - the quest will appear at the moment you left it. 4. Will I still have access to the quest after I finish? You can download all the questions and the answers as well as your route map as you finish - this way you can use them again to guide you in the city! However, once activated the code can`t be used again to start the quest from the beginning. 5. Will I need a GPS to orient me? Read carefully the questions and instruction where to go - all you need to find the place is already there! 7. What if I get lost & can`t find the answer? For this case you can always use our help buttons. First ones give you useful hints, last one reveals the right answer that will help you continue the quest. Remember that we are also here to help you. 8. Can I do it by bike/ in-line skates? Most of the roads are suitable for bikes - but some of the central streets may be too crowded and not convenient to drive. In-line skates are not recommended as most of the streets are made of block-stone. 9. What if the object of the route is not there any more? We update our hunts with the most recent info so you will always be able to find the right answer & continue your adventure! If there is something that just happened please call us, we will be very grateful to get the latest news from you and help you of course. Different neighborhoods and themes. Explore the city in a new way without getting lost and learn history and many interesting things without getting bored. Manage your time as you wish. Play any time you like and if you are tired continue the next day. Stop for a coffee or an ice cream or a picture whenever you want. A perfect plan for a date or an amazing family adventure! With a team of friends or alone – you will spend a great time. Get lots of tips of how, when, where and what to do in Barcelona and find dozens of things you never noticed before even if you live here!